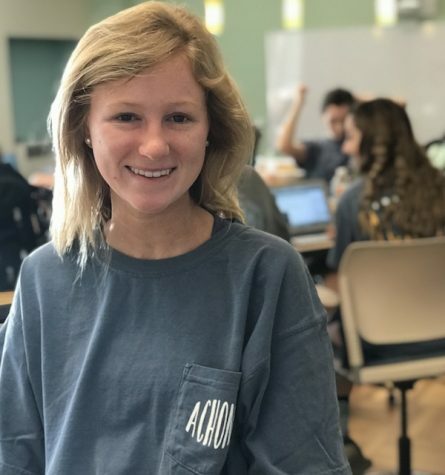 Elle Lehman is a senior and first-year journalist for Achona. She has a passion for helping others and volunteering. Lehman’s passion is shown through her work with the Creative Kids Club, an out of school organization that works on projects for various hospitals, abuse centers, and at- risk children. In her free time, Lehman also enjoys going to the beach, shopping and traveling with her family and friends. Going to concerts is also one of the something she loves to do. She says out of all other genres, country music concerts are the most fun to go to. At Academy, Lehman is involved in Ambassadors, Beta Club and Service Club. Her favorite subjects are English and History because both classes involve writing, something she likes to do. This year is her first on the Cross Country Team. Although running in the heat is hard, she likes the rewarding feeling she gets after finishing a race. Lehman is excited for her senior year and all the memories she is about to make. After graduating from Academy, Lehman plans to go to college out of state. Some of the places she is considering are Alabama, Georgia, and Texas. She wants to study to become a Nurse. Lehman has a white lab named Lola, she puts dimes in her penny loafers instead of pennies, and her favorite websites are Instagram, Soundcloud, and Vogue.